As the programming changed from memorial site visits to meetings with current and emerging leaders who are moving Rwanda forward, we seized the opportunity to visit the Office of the Canadian High Commission to Rwanda in Kigali. Promising that they would make an effort to avoid speaking to us in “Bureaucrat-ese”, Willow and James discussed the relationship between Canada and Rwanda. We learned that the first provost of the National University in Butare was a Catholic priest from the Université Laval in Quebec. The Canadian Catholic Organization for Development and Peace has been active in Rwanda since 1967. 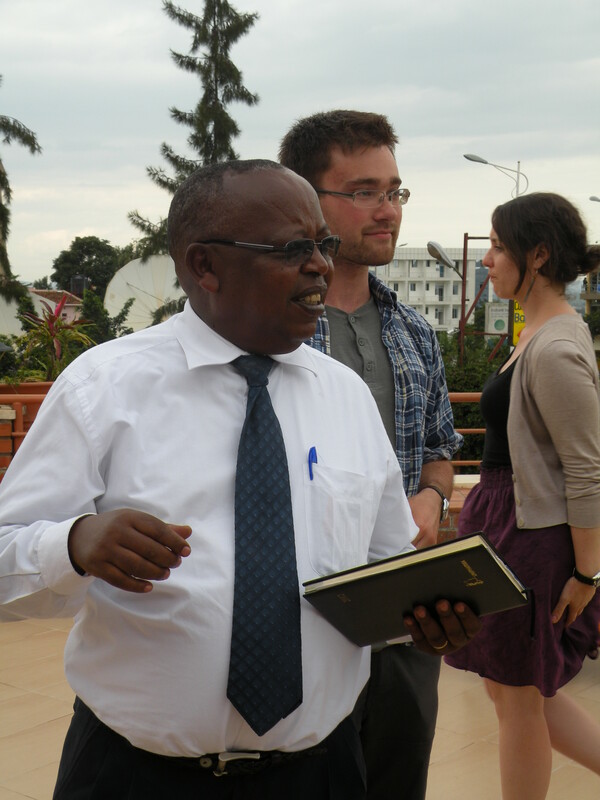 There are opportunities for student exchanges between Canada and Rwanda. We also discussed the influence of the funding cuts to the Canadian International Development Agency (CIDA) on development initiatives in the country. 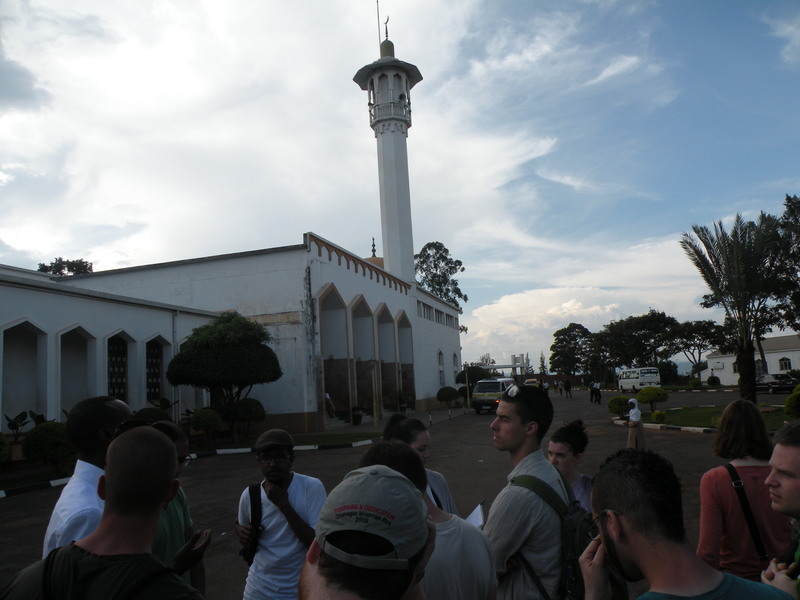 Then, we visited an Islamic cultural centre and school. The centre and school were a donation of the former ruler of the Libyan Arab Republic, Muammar Gaddafi. Reportedly, the centre and school were not attacked during the genocide and no one was killed there, we were told, because of fear that Gaddafi would intervene during the genocide if the Islamic centre was attacked. Later, we spent the afternoon at a coffee shop discussing religion and genocide. The discussion was not too profound and centred mainly around the failures, to say the least, of religious leaders and lay people to lead lives worthy of their callings. Absolutely no topic has been off limits on this trip. I admire my new friends for their courage to be challenged by controversy and their dedication to challenging others and inspiring them to reflection and action. A group of 18 scholars from Canada who came for official visit to Rwanda, on Wednesday May 23, 2012 were received by the Executive Secretary Mr. Mucyo Jean de Dieu at CNLG Headquarters in Remera, Kigali. Following that we had a meeting at the Association des Veuves du Genocide (AVEGA). AVEGA is an organization dedicated, in particular, to serving widows, orphans, the disabled, and elderly victims of genocide. Services provided range from medical aid to micro-financing grants. He was the most chipper and bubbly man. He seemed to laugh in such a way so as to stave off tears. Cracking endless jokes and speaking teasingly, we marvelled at his sense of humour while discussing the tragic events of eighteen years ago. 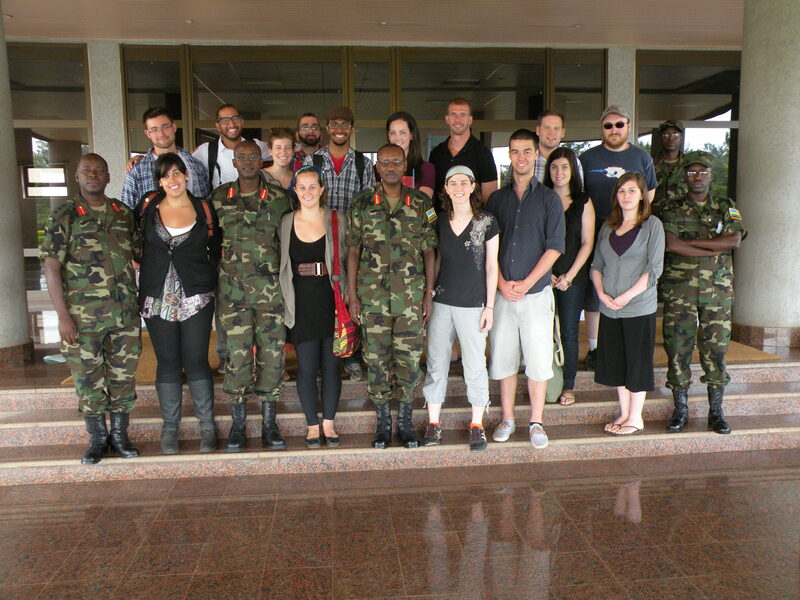 We also had the opportunity to meet with members of the Rwanda Defense Force (RDF). The military members who hosted us were extremely friendly. We felt as though we were receiving the sort of hospitality expected by lofty foreign ambassadors and not by students. The RDF members were courteous and engaged in an enriching period of questions and answers. A neat stop on the way to lunch one day included a visit to a gift shop filled with locally-made crafts. The shop is managed by the cousin of one of the founding students of Reflections on Rwanda, and so we were especially enthusiastic to shop there for souvenirs for our Canadian family and friends. We visited the Institut de Recherche et de Dialogue pour la Paix (IRDP), the Commission for Unity and National Reconciliation, and also attended an excellent presentation on the Gacaca courts. Operating under the principle that “justice delayed is justice denied” it was determined that the ordinary court system would not be adequate for trying genocide crimes in a timely manner. For this reason, Gacaca courts, a form of community justice inspired by ancient tradition, were used to try genocide crimes. With ordinary courts, only 6000 cases had been heard in 5 years. But in ten years, the Gacaca courts handled two million cases. There are three tiers in the Gacaca system. The first level concerns organizers, leadership, and planners in genocide. The second level concerns those who executed orders. The third level concerns property-related cases. In most cases, it was ruled that property stolen simply be returned or compensated. Immediate confessions often led to reduced sentences. Sometimes a perpetrator would receive the option to complete half of his or her sentence in prison and the other half in community service. The Gacaca courts are set to close on June 18, 2012. The people of Rwanda have made tremendous strides and the country is developing at an impressive pace. After spending one week focused on the past and the second week focused on the present and looking to the future, I have certainly learned a lot. Thank you to everyone who contributed to making this trip possible! In gratitude for their leadership, this post is dedicated to Audrey, Kurt, Rachel, Margot, and Faustin. 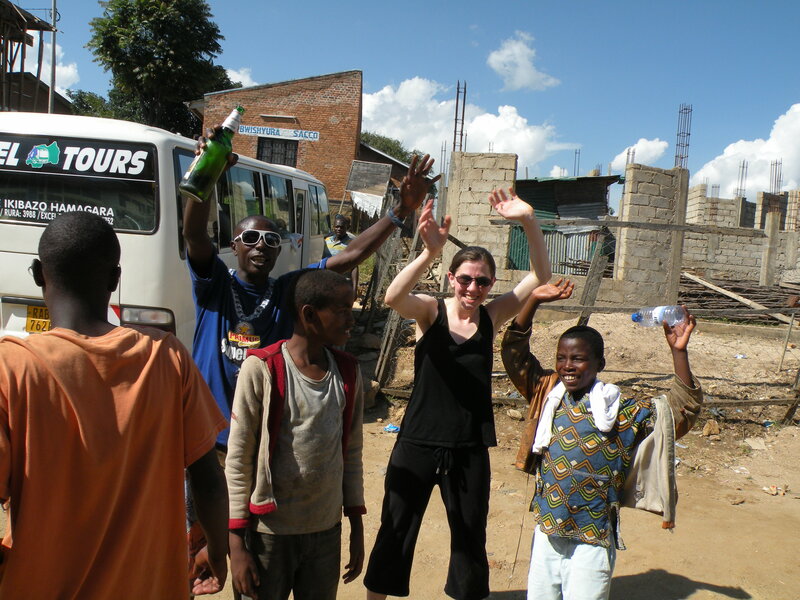 This entry was posted in Reflections on Rwanda, Travel, Uncategorized by Amanda Achtman. Bookmark the permalink.